Both Sauber F1 Team drivers Sergio Pérez and Kamui Kobayashi have been disqualified from today's Australian Grand Prix over the infrigement of technical rules 3.10.1 and 3.10.2 in the uppermost rear wing element. Article 3.10.1: "Any bodywork more than 150mm behind the rear wheel centre line which is between 150mm and 730mm above the reference plane, and between 75mm and 355mm from the car centre line, must lie in an area when viewed from the side of the car that is situated between 150mm and 350mm behind the rear wheel centre line and between 300mm and 400mm above the reference plane. When viewed from the side of the car no longitudinal cross section may have more than one section in this area. "Furthermore, no part of this section in contact with the external air stream may have a local concave radius of curvature smaller than 100mm. "Once this section is defined, 'gurney' type trim tabs may be fitted to the trailing edge. When measured in any longitudinal cross section no dimension of any such trim tab may exceed 20mm." 3.10.2: "Other than the bodywork defined in Article 3.10.9, any bodywork behind a point lying 50mm forward of the rear wheel centre line which is more than 730mm above the reference plane, and less than 355mm from the car centre line, must lie in an area when viewed from the side of the car that is situated between the rear wheel centre line and a point 350mm behind it." 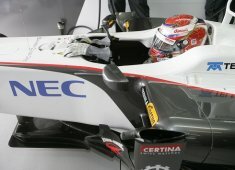 The statement of the Sauber F1 Team read: 'After having shown a great performance at the season’s opening race in Melbourne with Sergio Pérez finishing seventh and Kamui Kobayashi coming eighth, the Sauber F1 Team got excluded from the race results with both cars (Sergio Pérez and Kamui Kobayashi). The FIA stewards of the meeting have found the team in breach of article 3.10.1 and 3.10.2 of the technical regulations.